Planning Your Career Development Process: Your Roadmap To Success! Your road map to success begins with planning your career development process. There are many approaches you can take to accomplish this. The picture below represents a logical, step-by-step process designed to help you as you plan your career development process now, and anytime in the future when you want to change course. For example, you may want to be a manager in a large corporation, and then decide in a few years you'd really like to be an interior designer. Some steps will be easier for you than others. Taking time now to work through each of the steps will help build a solid foundation for your future. Writing your thoughts down can sometimes help you brainstorm ideas. Some of this may seem a little overwhelming, and with so many obligations, how will you have the time? If you set aside a small amount of time (30 minutes) each day, you will make progress. 1.) Self-Assessment. Discover your desires and passions. What would you do if money were no object? You may know exactly what you want to do. If so, move on to the next step. If you're struggling with this, there are some free and fee-based self-assessment tests available to help you. 2.) 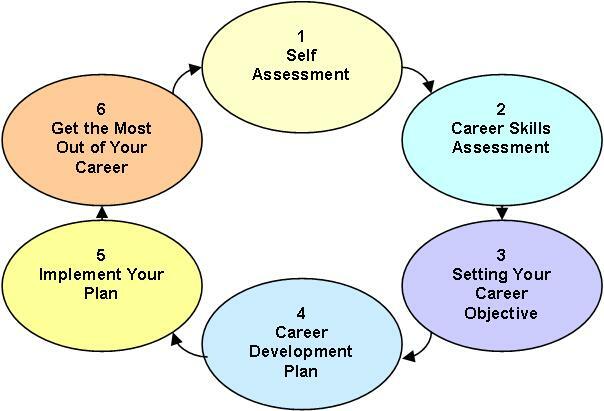 Career Skill Assessment. This sounds similar to the self-assessment, but rather than focusing on your personality and interests, career skill assessments focus on your core job strengths and weaknesses. Again, there are free and fee-based career skill assessment tests available to help you with this step. 3.) Setting Your Career Objective. Now that you understand your personality, interests, skills and strengths, it's time to make a decision! You may want to explore different career options to discover your best choice. 4.) Career Development Plan. The nuts and bolts of planning your career development process. Set goals and timelines based on your career objective. Look at an example career development plan, or use the career development plan template to help you work through this step. 5.) Implement Career Development Plan. It's action time! If your plan involves a career change, use the navigation bar on the left to help you through your career search, resume, cover letter and job interview questions. 6.) Get the Most Out of your Career. To get the most out of your new career, planning strategies and learning skills will help you get to the next level. We've also created a free e-course to help you with this step of the process. By planning your career development process, you're well on your way to your perfect career. Knowing your strengths and skills, along with having a plan, will give you the confidence and motivation you need to make a positive change.